Yahoo - Randy Gene Moss is one of the greatest wide receivers ever to play professional football. And now, a little more than four years after his NFL career came to an end, Moss is giving a new sport a try — soccer. Moss, who turned 40 last month, signed a contract with the United Soccer League’s Charlotte Independence (they’re a pro league a level below MLS) just one day prior to their season opener against the Charleston Battery. And this is cool: Moss will wear his No. 84 made famous with the Minnesota Vikings, Tennessee Titans and San Francisco 49ers as long as the USL and U.S. Soccer approve it. Watch out everyone, Randy is making a comeback! No, it's not in the NFL, but at least he's keeping it in the same name family. You know football and fútbol. He just wanted to take some time and learn how to properly play with his feet. That's my guess though, and I'm also trying to figure out what it is with wide receivers and their love of soccer? I mean is it because soccer players and wide receivers are similar built, have to be able to make quick movements, and have incredible control with the legs and feet? 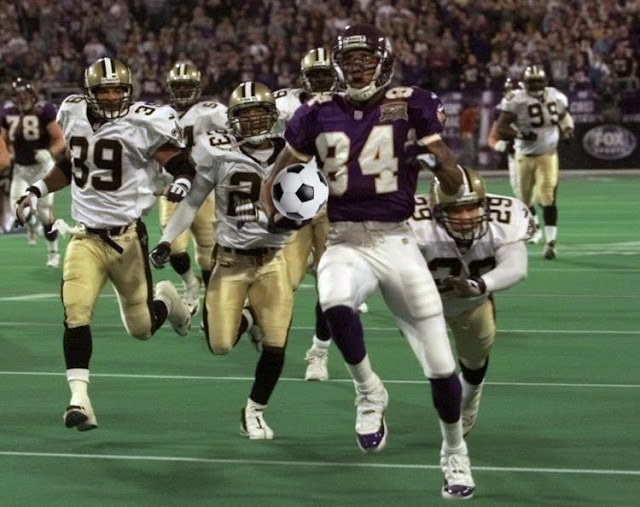 We've seen other former NFL wideouts try out for soccer teams. Chad Ochocinco had a 5 day test with Sporting Kansas City a few years back, but while he may have been the fastest guy, when it came to skills he resembled a toddler learning to walk. I guess Randy just wants to get his chance and show he can play semi-professional and give wideouts some pride back. PR wise it's a genius move because you're bringing in a future HOF (unless Bill Polian has his way) that is going to put asses both big and small into the seats. The Charlotte Independence (dumb name) will make more money with Moss on the field for 6 games then they probably did the past two seasons. It's just a hunch that's most likely 99% accurate. I'll wait for the highlight real from game one before I make my full judgment on if this "Return" was for PR or because Moss can actually play. Until then though, enjoy a clip of Moss showing off his soccer skills from about 9 years ago. Sign me up for season tickets now!